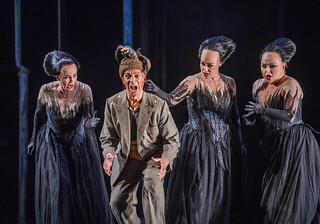 Susan Platts as Third Lady, Roderick Williams as Papageno, Angela Simkin as Second Lady, and Rebecca Evans as First Lady In Die Zauberflöte, The Royal Opera Season 2017/18 © ROH 2017. Photograph by Tristram Kenton. Susan Platts as Third Lady, Roderick Williams as Papageno, Angela Simkin as Second Lady, and Rebecca Evans as First Lady In David McVicar’s production of Mozart’s Die Zauberflöte, The Royal Opera Season 2017/18 © ROH 2017. Photograph by Tristram Kenton.